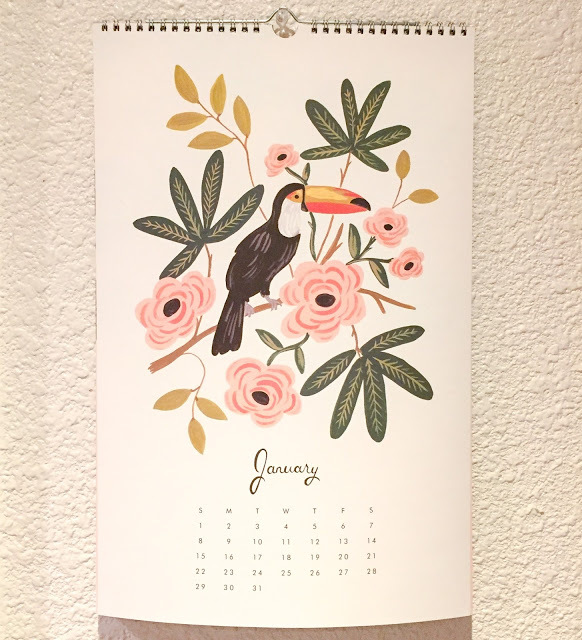 Loving my Rifle Paper Co. calendar for this year! I hope your 2017 is off to a fantastic start so far! I wasn’t sure exactly what I wanted to say for my first post of 2017. These days, I often come to this space with all these different posts that I want to share, but there just aren’t enough hours in the day to actually write them. It can be a little frustrating that I’m not able to post as often as I’d like and so when I do get around to posting, it can feel like I’m just doing it out of obligation. Not to mention, it seems like blogging isn’t as popular as it used to be. Many bloggers I used to love don’t blog anymore, and it seems like there’s so much more of a focus on Instagram now. And while I do love Instagram and tend to post there much more frequently, I’m not quite ready to quit blogging just yet! I started this space as fun, creative outlet for myself, so this year, I’m really going to try to keep that mindset and just post what I want, when I can, and not feel like it’s just another thing on my plate. So that said, I thought I’d share some of my goals for 2017! Some are more cliche resolutions, whereas others are more tangible things I’d like to accomplish in the coming year. I’m hoping that posting them here on the blog will help hold me accountable to actually getting them done! While I still love certain things about my design, I’m definitely hoping to make some changes this year more of a blank slate with a more clean look. I’d also like for things to be more organized, but also a little more simple, if that makes sense? Still brainstorming, but I’m hoping I can start making some changes soon! Over the past couple of years, I’ve spent lots of time at midwife appointments monitoring my pregnancies and I’ve also spent plenty of time at the pediatrician’s office with Henry and now with Charlie for well child visits. But I’ve basically let my own non-pregnancy related appointments fall by the wayside…eeek! I desperately need to go to the dentist, I need to find a new primary care physician (mine moved right before Henry was born), and I need to get new glasses! Hoping to do all those things (ASAP) this year, plus be better about doing basic things like drinking enough water and taking my vitamins and other things that I tend to forget about taking care of the boys! This month, Cam and I are in a total declutter and organize mode and most days, I feel like we’re pretty good about keeping the house relatively tidy. But with two small kids, it can be hard to ever get much actual cleaning done. So I would like to get better about being consistent with a cleaning schedule, that way I can break things up throughout the week and hopefully accomplish a little more. They covered some basic stuff in the infant care class we took before Henry was born, but now that we have two kiddos, I feel like this is something I could definitely use a refresher on! I know everyone says this at the start of the new year, but I really need to. I’ve been eating wayyy too much sugar these past few months and I know that needs to stop because it’s just bad on so many levels. Taking care of a baby and a toddler is a lot, and so I want to eat a diet that will help give me more consistent energy throughout the day instead of a sugar filled diet that makes me feel sluggish. Cameron and I used to eat more consistently Paleo before moving to Portland and so we’re trying to get back to that. Although I’m not so concerned about being strict Paleo as I am with just eating real, nutrient dense food and eating less sugar/processed crap. Baby boy is sleeping in our room at the moment, and even though we probably won’t be moving him to his room for another few months, I’d love to get his nursery done ASAP! We have already painted his room, purchased another crib, and we have a few other things for it, but that’s it. I still love the room we put together for Henry and now that he’s older, he seems to love his room too. So now that the holidays are over and things are calming down a little, I’m looking forward to putting together a space that’s just as special for Charlie! Since having Henry, I rarely pull out our camera anymore and take almost every single photo with my phone. But I’d really like to learn how to take better photos with it so I can get some decent non-phone photos of the boys now and then! I really enjoy working out and used to love taking group fitness classes, but after two pregnancies, I’m really out of the habit of exercising. I know that Henry and Charlie are going to keep me on my toes and I want to make sure I have the energy to keep up with them as well as the muscle strength to carry them around because they’re both big boys! I really want to get back in the mode of working out on a regular basis and I’m hoping I can be consistent with it throughout this year! This is going to be a tough one because I’m such a night owl, but I know that I’ll have much more productive days if I get up earlier in the mornings and get myself ready before Henry and Charlie are up. I’m cutting myself a little slack now since Charlie is still pretty little and waking up to nurse during the night, but once he’s on a better schedule, I know our days will go so much more smoothly if I just make the effort to get up earlier and get my day started vs. waiting for the baby monitor to wake me up! I’m so thankful for the abundance of blessings in my life and I really want to be better about giving back in 2017. Whether that’s contributing financially to organizations helping those in need, spending my time volunteering, or just random acts of kindness in my day to day life, I really want to do what I can to help make a difference this year. What about you? Do you have any goals/resolutions for the coming year? Photography is on my list too. I've taken a couple workshops and they help SO much. I would look for one in your area! Love your list. FYI, Blink PDX is in your hood and my personal favorite eyeglass shop I've ever been to. Hit them up to get your eyes looked after! I want to make a cleaning schedule, too!